The first half of spring has been rather warm across most of California, with temperatures ranging from slightly above average in the north to well above average in the south. The winter storm parade continued across Northern California right through most of April, but late-season precipitation has been rather meager indeed south of the Bay Area. Los Angeles and San Diego have both seen less than 25% of average precipitation over the past two months, though seasonal precipitation remains above average even across Southern California due to the heavy precipitation experienced during the heart of winter. The season’s first real heatwave occurred this past week across much of California, and in some-cases brought record-breaking high temperatures for early May. It should be no surprise that melting of the prodigious Sierra Nevada snowpack is now well underway, and several rivers in snow-fed watersheds are currently near or above flood stage. Since temperatures are likely to cool substantially in the coming days, serious snowmelt flooding is unlikely in the near term. There is still a tremendous amount of water stored in the snowpack at high elevations, however, so a particularly intense or prolonged heatwave later in May or in early June could still pose a risk of more widespread snowmelt flooding. An unusually “wavy” atmospheric pattern is currently evolving over the entire Northern Hemisphere, with significant implications for California weather over the next couple of weeks. The development of a pronounced and remarkably well-defined “wavenumber 6” pattern in the mid-latitudes has been a source of substantial interest in the meteorological community in recent days, and for good reason: this kind of atmospheric arrangement is strongly associated with slow-moving and sometimes extreme weather conditions as high-energy “kinks” in the jet stream become “stuck in place” across certain regions. For those of you wondering what the heck “wavenumber 6” even means, the explanation is actually rather straightforward: it literally refers to the number of complete atmospheric “ridge-trough” cycles across a particular latitude band. In other words, we know that a “wavenumber 6” pattern is in place just by counting the number of blue troughs (or red ridges) in the adjacent figure. High wavenumber atmospheric patterns (n=6-8) have recently been of particular interest in the meteorological community due to their propensity to cause extreme weather events. “Wavy” atmospheric patterns tend to displace cold, dry polar airmasses toward the equator and warm, moist tropical airmasses toward the poles–and the strong thermal contrasts this creates are conducive to the development of alternating zones of heatwaves, cold outbreaks, and flooding rains (and that’s exactly what is expected to occur in the coming days across the Northern Hemisphere). Once in place, these patterns tend to remain “quasi-stationary”–exhibiting a high degree of persistence and moving very slowly (if at all). Recent evidence suggests that the frequency of high-wavenumber patterns has increased during the Northern Hemisphere warm season, which may be linked to rapid Arctic warming and the subsequent loss of sea ice. The Potsdam Institute has created an excellent, broadly accessible video on this topic for those interested in learning more. What are the California implications of the wavy, sluggish atmospheric pattern discussed above? Well, it appears that a fairly persistent trough will develop near the West Coast over the weekend, potentially persisting in some form for the better part of the next two weeks. This will bring much cooler temperatures to all of California, and occasional precipitation to much of the state at times. The initial event may be the most interesting, as a rather deep and cold low pressure system “cut off” from the main jet stream will develop directly over the California coast on Saturday. 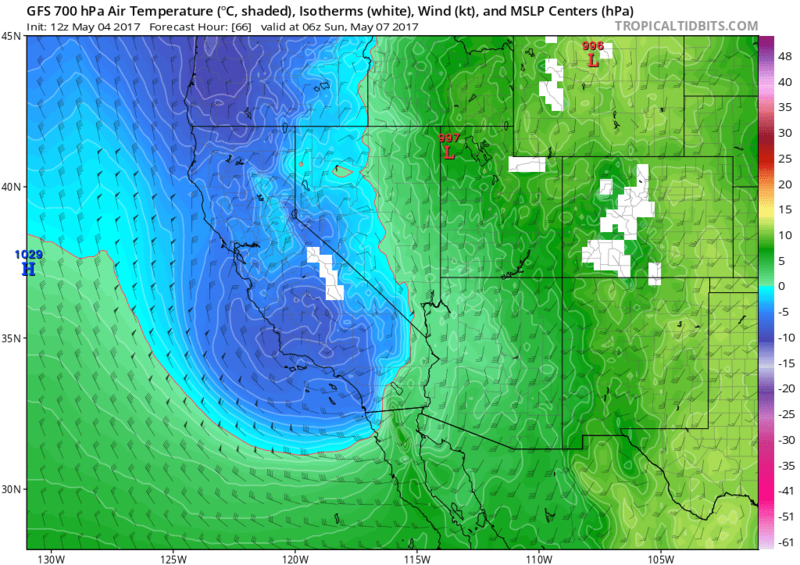 While this system will be rather moisture-starved, it will be associated with a fair bit of atmospheric instability by California standards due to some impressively cold mid-level temperatures for early May. As a result, widespread mountain precipitation is expected statewide–including significant Sierra Nevada snowfall and perhaps even some snow accumulation in the Southern California mountains. Showers and even some significant thunderstorm activity are also pretty likely at lower elevations, especially across Southern California where the coldest air aloft will combine with slightly more moisture and favorable mesoscale dynamics. Some thunderstorms will also be possible across the Central Valley over the weekend. Just about the only spot that may miss out on the convective action entirely may be the Bay Area, where only isolated activity is expected. 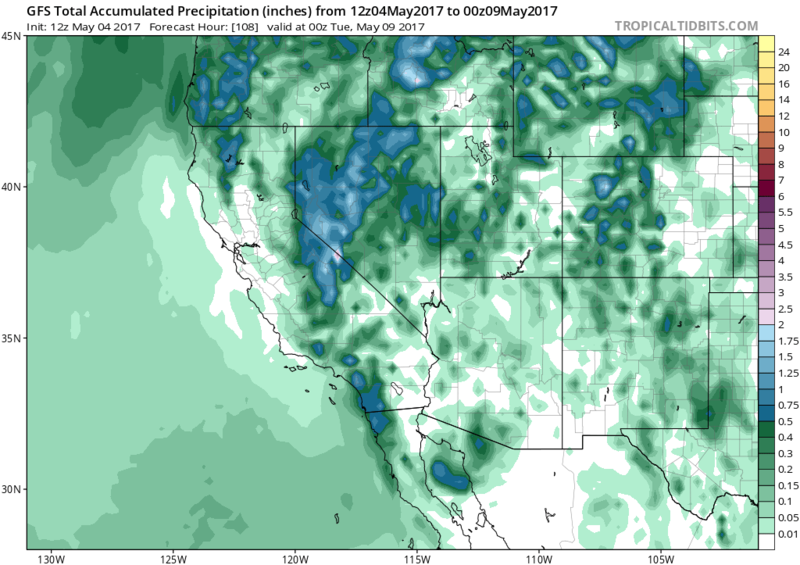 The good news is that the parts of California which have been quite dry in recent weeks–namely, the southernmost third of the state–will likely see fairly widespread (if modest) precipitation over the weekend. Some stronger thunderstorms may also occur, with heavy downpours and hail possible in isolated spots. As is often the case with cut-off lows, there is some uncertainty regarding how quickly this system will move away from California. While the GFS moves the system out rather quickly, the ECMWF lingers the low pressure area over Southern California through Tuesday–continuing the chance of showers and thunderstorms. At this point, I’d bet on the slower solution…especially given the sluggish large-scale pattern over North America. By the middle of next week, Southern California will likely dry out, but the quasi-stationary West Coast trough may allow more precipitation to creep back across the northern part of the state. In fact, recent model ensemble runs suggest that an above-average likelihood of precipitation and relatively cool temperatures will continue through at least the middle of May. Finally: for those who are interested, I will be giving a public talk (and Q&A session) on California weather and climate in Ojai on May 20. Details are available here. © 2019 California Weather Blog. All rights reserved. Theme by Solostream.